Refractory Ceramic Fiber (RCF). Temperature Grade: 2300°F (1260°C), 2600°F (1430°C). Fiberfrax® ceramic fiber products are manufactured from alumina-silica materials and offer such characteristics as high temperature stability, low thermal conductivity, low heat storage, excellent thermal shock resistance, light weight, and superior corrosion resistance. Fiberfrax ceramic fiber products exhibit thermal stability at temperatures up to 1430°C (2600°F). 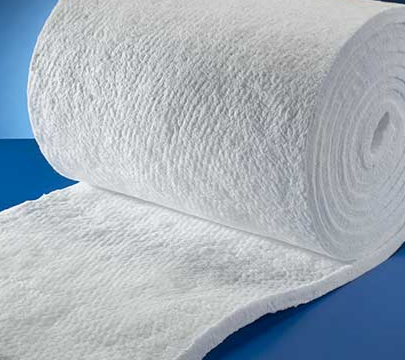 The Fiberfrax blanket and mat product family consists of a group of lightweight, thermally efficient ceramic fiber insulating materials that combine the advantages of both low heat storage and complete resistance to thermal shock. Offering a broad range of thermal capabilities and physical characteristics, this product family provides proven and effective solutions to a variety of heat processing applications. Durablanket® ceramic fiber products are high strength, needled insulating blankets that are made from spun Fiberfrax ceramic fibers. The extra-long spun fibers, cross-locked through a unique forming process, produce a blanket with exceptional handling strength. This product family is completely inorganic and available in a variety of temperature grades, densities and sizes. Fibermat® blanket, PH blanket, and Moist Pak-D® insulation provide additional options for specific application requirements ranging from high-temperature filtration to hot gas velocity resistance. Fibermax® mat is a high-temperature, flexible mat product entirely composed of Fibermax polycrystalline mullite fibers, making it an extremely lightweight, highly resilient insulator that is virtually free of unfiberized (“shot”) particles. Unifrax India Limited was established in the year 1985. We are one of the leading manufacturer, supplier and exporter of a wide range of high temperature ceramic fiber products. In the year 1985, we have started our work in association with Combustion Engineering, U.S.A, and were known as Orient Cerwool Ltd. Further, in 1999, St Gobain, France bought over the organization and changed its name to Orient Cerlane Ltd. Moreover, in the year 2000, Unifrax bought over St Gobain’s Ceramic Fiber Business and the name was changed into Unifrax India Limited. Its ISO 9001, 14001 and OHSAS 18001 accredited facility at Lakhtar, Gujarat produces Refractory Ceramic Fibre products in all grades and forms. We are part of UNIFRAX Corporation, a company with long and respected heritage. With manufacturing & sales presence in most of the world's major industrial regions, and a leadership position in the global high temperature fibres market, Unifrax offers its worldwide customers high quality products, service and support that have become Unifrax hallmark. The key technology in the production of Unifrax high temperature fibre products is the fiberization of the molten material. This advanced process is the result of more than six decades of experience in the evolution of refining and processing technologies developed by Unifrax engineers. This allows an extremely high degree of precision in the control of fibre properties which are critical to the final product characteristics. Unifrax India can also offer the entire range of products manufactured at Unifrax's various manufacturing plants which include Insulfrax and Isofrax Soluble Fibre Products, Catalytic Converter Mats, Coatings, Cements, Mixes etc required for variety of applications throughout the broad spectrum of industry.